Santa Clara, CA - (Marketwire) - Intelleflex, a leading provider of on-demand data visibility solutions, today introduced two new additions to its product family. The new HMR-9090 Handheld Reader and FMR-6000 Fixed Reader work with Intelleflex tags to enable wireless, on-demand, product-level monitoring by providing the ability to read at distances up to 100 meters or through RF-challenging environments that include metals, liquids and inside packages and containers. Utilizing Intelleflex XC3 Technology™, the suite of products is based on the ISO/IEC 18000-6 and EPCglobal C1G2 RFID multi-protocol standards and is designed for temperature monitoring, asset tracking and other applications. Leveraging patented technology that yields a disruptive price/performance model, the Intelleflex Extended Capability RFID™ solution is uniquely suited for the cold supply chain, where product-level monitoring is critical but has been cost-prohibitive to date. By providing in-transit visibility of cold-chain product temperature data at the package level, Intelleflex allows producers, shippers, distributors and retailers to monitor product freshness and quality, on-demand, on fully loaded pallets or totes, delivering the ability to save billions of dollars of annual losses by avoiding product waste. "An increasing number of key industry sectors are seeking automated data capture solutions that extend beyond reading a 'license plate ID' on an asset, object or item," said Michael Liard, RFID Research Director for ABI Research. "As a result, extended-capability RFID solutions are poised to deliver value for certain applications including 'What is it?' and 'Where is it?' to 'How is it?' For example, temperature sensing and recording are currently in tests for fresh produce, fresh and frozen meats, and pharmaceutical and laboratory applications, to name a few." The Intelleflex solution addresses the increasingly critical problem of perishable-produce waste. According to a recent study by the United Nations Environment Program (UNEP), over half of the world's food production is lost, wasted or discarded as a result of inefficiency in the human-managed food chain. The UNEP study reported that up to one-quarter of all fresh fruits and vegetables in the United States are wasted between the field and the table. A study conducted by the University of Florida Research Center for Food Distribution and Retailing stated that one-third of shipped produce is wasted annually, amounting to a loss of $35 billion each year. Half of that waste is a result of temperature-related mismanagement -- totaling over $17 billion a year. The Intelleflex product suite also addresses the increasing demand for in-transit temperature monitoring solutions that is associated with the dramatic growth in temperature-sensitive pharmaceuticals and biologics. According to a 2006 study by the World Health Organization, biopharmaceuticals, which by nature are temperature-sensitive, require temperature checking, monitoring and recording -- and it notes that temperature-monitoring data should be made available for review. The study goes on to say that deficiencies in good distribution practices, with specific focus on temperature control and monitoring during shipment, have been cited as an ongoing issue by the FDA. The breakthrough capability of XC3 Technology readers and tags to penetrate perishable produce and insulated packaging, or to read at a distance of 100 meters in free space, delivers an industry-leading wireless solution for accurate product temperature monitoring of food or biopharmaceuticals. Through these products Intelleflex delivers on-demand data visibility and temperature logging required to monitor cold-chain shipments -- from producer to retailer -- and to make proactive, real-time decisions, preventing product loss, stock-outs, and lost sales while improving shelf life and product quality. The Intelleflex cold chain solution can reduce temperature-related shrink in fresh produce by up to 50 percent while verifying in-transit product integrity of temperature-sensitive pharmaceuticals up to 100 percent of the time. While Intelleflex breaks new ground in on-demand cold-chain monitoring, it also sets a new standard for cost-effectiveness for technology solutions in its class. At costs of one-third to one-fifth those of similar products that use active-tag technology, the Intelleflex solution helps users across the supply chain in their goals to improve operations and profitability. "As a result of inadequate temperature monitoring, producers, shippers and grocers continue to see excessive product shrink through perishable-food waste, with comparable impact to the biopharmaceutical supply chain," said Peter Mehring, CEO of Intelleflex. "Intelleflex gives cold-chain providers the tools they need to actively manage product in-transit -- resulting in reduced shrink, higher product quality and safety verification -- and improved efficiency throughout the cold chain." During the initial stages of deployment of the Intelleflex Cold Chain solution at the Hawaii Department of Agriculture (Honolulu, HI) and Clifford Produce (Ruthven, Ontario, Canada), users cited marked improvement in their operations and quality control. "In-pallet monitoring of produce temperatures -- all the way from the warehouse to the retailer -- will enable us to ensure a high-quality product for consumers," said Dr. John Ryan, Quality Assurance Administrator, Hawaii Department of Agriculture. "The Intelleflex suite, which delivers true on-demand visibility, gives us the confidence that fresh produce is properly stored throughout the delivery chain, while ensuring food safety accountability at every step in the process." "Clifford Produce Sales is excited to be the first ever produce grower and shipper to utilize the new technology offered by Intelleflex and its solution partners," said Mike Glass, Sales Manager, Clifford Produce Sales. "This new technology gives us the capability to have real-time inventory visibility within our facility, on-demand, combining that information with overall traceability and quality management. Our plans are to continue working with Intelleflex to empower us to manage our inventory on a First Expiring First Out, versus First In First Out, basis. We will continue to integrate cutting-edge and cost-effective technology in our facilities and throughout the supply chain, which will enhance food safety and food quality, reduce shrink, and improve operational efficiencies and grower profits." Intelleflex works with leading software developers and domain-specific channel partners to provide complete industry solutions. Temperature logs and other product-level data can be conveniently stored in the Intelleflex tag's ample on-board memory and easily accessed and input into ERP and other applications via Intelleflex fixed or handheld readers -- without unloading the pallet or opening the container to retrieve the tag. Intelleflex tags are also both NIST (National Institute of Standards and Technology) and Federal Aviation Administration (FAA)-compliant, and can accurately and safely monitor in-package temperatures while in airplane cargo holds. Intelleflex solutions -- available today in the cold chain for produce and pharmaceutical monitoring, safety and traceability -- also support a wide range of asset management, personnel monitoring, and supply chain applications by providing cost-effective, on-demand visibility. Intelleflex XC3 Technology products, which include tags and readers, support both the EPCglobal C1G2 and the recently approved ISO/IEC 18000-6 Standard, which defines the Class 3 protocol. The ISO/IEC 18000-6 Standard will be published in late 2010 or early 2011. XC3 Technology implements the Class 3 protocol to deliver the performance and capabilities of active RFID, but at a fraction of the cost, making Intelleflex products a cost-effective and powerful option. 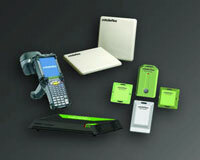 The Intelleflex handheld and fixed readers and suite of Extended Capability RFID tags are available today. The company has also announced the availability of the Intelleflex Starter Kit, which enables end users to pilot and test applications in the lab or in real-world conditions. Pricing for the Intelleflex Starter Kit begins at $2,495. For more information, contact Intelleflex toll-free in the U.S. at 877-694-3539, or outside the U.S. at 408-200-6500, or visit www.intelleflex.com. Intelleflex provides on-demand, data visibility solutions for cold chain and asset management. Its industry-leading XC3 Extended Capability RFID products and technologies enable a range of solutions for perishable food and pharmaceutical temperature monitoring, asset tracking for construction and other remote worksites, vehicle/yard management, security and access control, and other applications. These solutions deliver real-time monitoring that can help organizations reduce shrinkage or loss, more closely track and manage assets, reduce their cost of operations, and increase profitability. For more information, visit www.intelleflex.com. Intelleflex is a registered trademark, and XC3 Technology and Extended Capability RFID are trademarks of Intelleflex. All other trademarked names in this document are the properties of their respective owners.